It was the '70s all over again at the communist organised anti war rally in Washington DC yesterday. 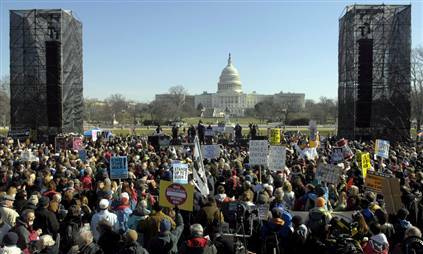 Jan. 27 Anti-war protesters from across the nation including Jane Fonda rallied in the shadow of the Capitol building in Washington today to demand that Congress block President George W. Bush's new plan to send more troops to Iraq and withdraw those already there. The demonstration, the first national peace rally since voters gave Democrats a majority in the U.S. Congress in the November elections, drew tens of thousands of people. Among them were activists such as Jesse Jackson, politicians such as Representative Dennis Kucinich, an Ohio Democrat, active-duty soldiers and families with children serving in Iraq. ``I haven't spoken at an anti-war rally in 34 years because of lies about me that were used to hurt the anti-war movement,'' Academy Award-winning actress and fitness guru Fonda told the cheering crowd. 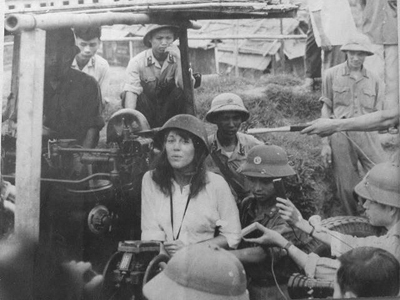 Fonda was referring to the criticism that dogged her for decades for speaking against the Vietnam War from Hanoi in 1972 and being photographed seated at a North Vietnamese anti-aircraft gun. Actor Sean Penn said lawmakers will pay a price in the 2008 elections if they do not take firmer action than to pass a nonbinding resolution against the war, the course Congress is now taking. The House Judiciary Committee chairman, Rep. John Conyers, threatened to use congressional spending power to try to stop the war. "George Bush has a habit of firing military leaders who tell him the Iraq war is failing," he said, looking out at the masses. "He can't fire you." Referring to Congress, the Michigan Democrat added: "He can't fire us. "The founders of our country gave our Congress the power of the purse because they envisioned a scenario exactly like we find ourselves in today. 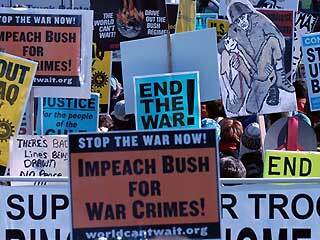 Now only is it in our power, it is our obligation to stop Bush." I notice there was a major effort on the part of Communist front groups since even prior to the invasion of Afghanistan. They've been building for a while MAH. In some ways they're more influential than in the '70s. At least them they had some opposition. And yet they're the ones who suggest we're "stuck in the past". It's also quite strange how they often use their own brand of McCarthyism when they always suggest anyone who is pro-American, pro-Israel or anti-Communist is a "fascist" or on the "far right" fringe even when the far right endorse much of their various conspiracy theories. Oh god, Jane Fonda and Sean Penn. That pretty much sums up the movement right away.